Spectacular year-round, Grand Teton National Park boasts much of the same flora and fauna it has since prehistoric times. Dozens of mammals including moose, elk, deer, grizzlies, cougars, wolverines, beavers, and bison still relish in the splendors of the region. Aspen groves, the subalpine forest of fir, and Engelmann spruce seamlessly meld with alpine wildflower meadows with pockets of prairie grasses and sagebrush flats scattered about – just as they have for thousands of years. The rich history of Grand Teton lives on in the physical landscapes, the creatures that inhabit these lands, and the spirit of the individuals whom both fought for and against the park's eventual establishment in 1929. Legendary mountain man Jebediah Smith dubbed the valley Jackson Hole in honor of his trapping partner, David Jackson, who dearly cherished this serene place. However, these gents were far from the first to roam or lay eyes upon these lands. More than 11,000 years ago, hunter-gatherer Paleo-Indians traversed the valleys and mountains during temperate seasons indulging in the surplus of elk, bison, pronghorn, and moose that grazed here. These natives also spent time crafting tools here to use for survival and hunting, and many relics and artifacts are on display at the numerous Visitor's Centers and museums within the park. Upon arrival of harsh winters, these tribes would migrate to warmer locales. Explorer John Colter of the Lewis and Clark Expedition navigated the Tetons during his 1807 reconnaissance of Yellowstone Country, and around 1810 Jackson Hole became a central hub for fur trading companies and trappers seeking out lucrative beaver pelts. Government expeditions of the region began in the 1850s; however, it wasn't until the 1880s that the first permanent settlers took root in the valley. 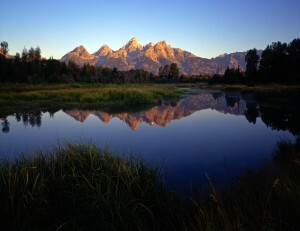 Adjacent Yellowstone National Park's creation received nearly unanimous public support even though it was the first national land preservation of its kind; however, there was much opposition to Grand Teton earning such status. Anti-park sentiments concerning the expansion of the project hit an all-time high because the deal was to include governmental jurisdiction over affairs within Jackson Hole – a concept received by many early settlers as a threat to personal freedoms. Ultimately, it took 50 years, three government acts, and the foresight and generosity of tycoon John D. Rockefeller to make the dream of a unified and expanded Grand Teton National Park a reality. Today, these parks coalesce to comprise the bulk of the Greater Yellowstone Ecosystem, an intact temperate ecosystem that happens to be one of the largest in the world. These are the mountains of dreams, and visitors come to the Tetons for the vast beauty of contrasting mountains and serene valleys, the exhilarating activities, the surplus of wildlife, and the array of comfortable lodging near Grand Teton. The park is equally stunning year round, with snow gracing the vistas each winter after the vibrant fall leaves have fallen, while warmer weather beckons water and nature enthusiast to pay a call to the majestic Tetons. Outdoor activities abound within the park, which in the summertime include backwoods hiking, swimming, trout fishing, and floating on the Snake River. Winter enthusiasts enjoy the park's scenery, yet the action just outside the park's boundaries includes world-class snowmobiling, for which permits and fees are required. Visitors can experience it all through an extensive collection of accessible and marked trails all along the park's most popular scenic driving routes. Teton Park Road heads from the base of the Teton Range in Moose all the way to Jackson Lake Junction, and Jenny Lake Scenic Drive follows the eastern shore of the lake heading toward the mountains. Signal Mountain Summit Road escalates nearly a thousand feet offering panoramic sights for miles. Top hiking trails include Death Canyon, Hermitage Point, Granite Canyon, Lupine Meadows, Jenny Lake, and Leigh Lake Trailheads. Explorers are rewarded with some of the park's most stunning and unforgettable views of the mountains, lakes, and the wildlife that freely roams the park from overlooks and wildlife viewing areas such as Timbered Island, Mormon Row, Cascade Canyon, and Oxbow Bend. Conveniently, there are six Visitor's Centers throughout the park that offer maps, guided tours of the top attractions and hiking trails, and these folks also help arrange excursions, permits, and assist with other visitor's needs. Signal Mountain Lodge – Lodge style rooms and retreats adjacent to Jackson Lake, staying at Signal Mountain Lodge puts guests in the midst of the park's finest natural wonders. Colter Bay Cabins – Also on the shores of Jackson Lake, visitors can opt for log cabins or basic tent-cabins, and these accommodations in Grand Teton offer fishing and horseback riding amenities onsite. Jenny Lake Lodge – Stay in the main lodge or one of the rustic guest cottages at Jenny Lake Lodge, where full-service comfort is to be expected. 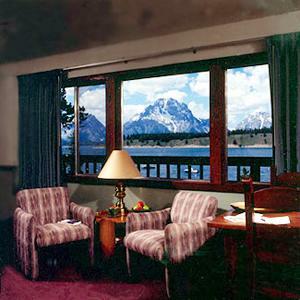 Jenny Lake Lodge is an all-inclusive lodging facility that includes daily breakfast and dinner, as well as activities such as horseback riding and bicycling. Many opportunities exist for lodging outside the park as well. Lodging near Grand Teton or near Jackson Hole includes ample options where you will find additional amenities to complement your vacation. If visiting both Yellowstone and Grand Teton National Park are on the agenda, consider accommodations or lodging near the southern boundary of Yellowstone. Headwaters Lodge and Cabins at Flagg Ranch – Ideal for park hoppers, these log cabins are perfect for couples and small groups and are ideally situated between the two parks. These pet-friendly accommodations near Grand Teton and Yellowstone are rugged, yet cozy. If you prefer the excitement, shopping, dining, and nightlife of Jackson, you might consider the following Jackson Hole accommodations. Four Seasons Resort & Spa – For those seeking pampering between sightseeing, the Four Seasons Resort overlooks picturesque Jackson Lake and the Tetons. Arguably, this is the finest lodging in Jackson Hole. Snake River Resort & Spa – At the foothills in Teton Village, Snake River Resort & Spa offers luxury condos and well-appointed guests rooms and is a favorite within Jackson Hole Mountain Resort. With so many glorious adventures to be had within the boundaries of Grand Teton National Park, now is the time to plan your next respite with nature.